And while I say that there’s little room to grow when you begin at the top anyway, that’s just regarding the author’s ability to put across his tale. There is always room for the work itself to grow, and Nick has become extremely proficient at crafting a plot that is tight, clever and self-contained, and yet allows for exploration of subplots, outside themes and character expansion throughout. I think that is the most notable thing about this novel: the character growth. In book one we were introduced to Cassius Corbulo, unwilling secret service man, and to his stalwart slave Simo. In book 2, in a move about which I was initially skeptical, we met the gladiator Indavara and saw him become Corbulo’s bodyguard. In book 4, they acquired a mule. Essentially, several disparate characters, each as deep as the next, have become a family and the reader cares about them all, and not just the principle protagonist. In fact in some ways, he is the shallowest of them and it is the lives of his companions that actually draw the sympathy and interest of the reader. In The Emperor’s Silver (the fifth volume in the series) we find Corbulo in Syria following his unpleasant sojourn in Arabia in the previous book. He and his people are still suffering strained relationships after those events and Corbulo himself is still trying to come to terms with killing a man in cold blood. In an effort to avoid the bloody revolt going on in Egypt, Corbulo inveigles his way into Marshal Marcellinus’ good books and gets himself assigned to the Levantine cities to investigate a case of counterfeit coinage. 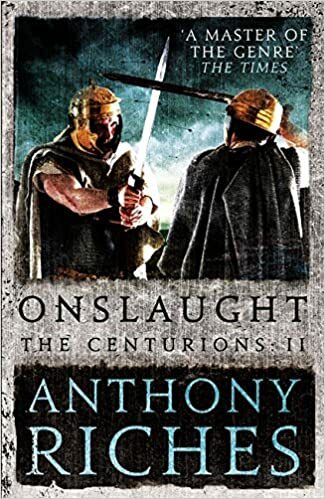 The beauty of the Agent of Rome series’ premise (as opposed to say my own Marius’ Mules books, which are grounded solidly in military campaigning) is that the potential for stories is vast and all-encompassing. Nick’s plots are each fresh and varied, and each book carries us to new territory, never growing stale. Appropriately, this is a new and fascinating plot, investigative and tense, more social and character-driven than the previous work, which involved a great deal more action and espionage. Book 5, though, has two particular subplots running throughout that add something strong. The first is Indavara. After three books with the history of the gladiator only loosely hinted at (the man has no memory of his time before the arena) Nick has opened up the Pandora’s box of Indavara’s past. Only a crack so far, with tantalising glimpses of what’s to come. And secondly, someone is after Corbulo! I mean there’s always someone after Corbulo. It’s part of his job that he makes enemies, but in this case, it seems to be something else, disconnected from the plot. And these two subplots are not quite what they seem. They… oh well I’ll let you discover that for yourself. No spoilers here. If I had one small criticism of book 5 it would be the number of plot threads left open at the end. I realise that this is a deliberate choice and understand clearly why Nick has concluded it in such a manner, though it feels a little like the last page should simply say ‘Tune in next week for…’ The flipside of that, of course, is that we know how book 6 is going to start and what at least part of it is going to be about. Personally I can’t wait to see what happens next and as usual I will be on Twitter, badgering Nick for news of the next book. The Emperor’s Silver continues the high standard Nick Brown set himself to begin with, the plot strong, the characters vivid, the atmosphere heady and exotic, the descriptive imaginative and the pace fast and comfortable. As with all the previous volumes it is a book that I picked up intending to ready 20 or 30 pages and put it down 100 pages later. If you’ve read books 1 to 4, The Emperor’s Silver is released today and you really should go get it. If you haven’t, where have you been? But now is an excellent time to catch up. Go buy Agent of Rome 5 today and you’ll be glad you did. Put aside a few days and be prepared to lose yourself in Roman Syria. My interest in the Tudor era stemmed not from my history teacher (who was a teacher of the most excellent sort), and not from books (I was not reading history texts at that age), but from two things: My first visit to the historical sights of London – including the Tower and Hampton Court – and the Royal Armouries (then in the tower) with the magnificent armour of Henry VIII. Needless to say, as a lover of history, the interest that triggered has never left, and though my focus is primarily on the ancient world, I still love a little Renaissance culture from time to time. 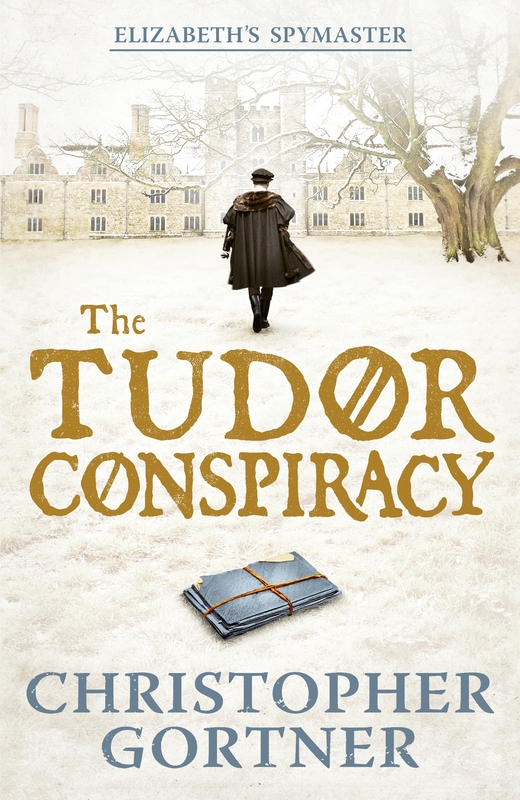 If, like me, you’re fascinated by the intrigues, plots, wars and religious troubles of the Tudor era, you’re probably already aware that Christopher Gortner, author of a number of excellent novels, including The Queen’s Vow – Review here, has a fabulous novel out, named The Tudor Conspiracy, already available in hardback but now in paperback release. The sequel to The Tudor Secret, and second in the ‘Elizabeth’s Spymaster‘ series, this novel sees Mary Tudor, new to the throne of England, facing plots and threats. Her half-sister Elizabeth is in grave danger as one of Mary’s perceived enemies, and only the resourceful Brendan Prescott can save her by plunging into a world of danger and plots. My thanks again to Christopher Gortner. 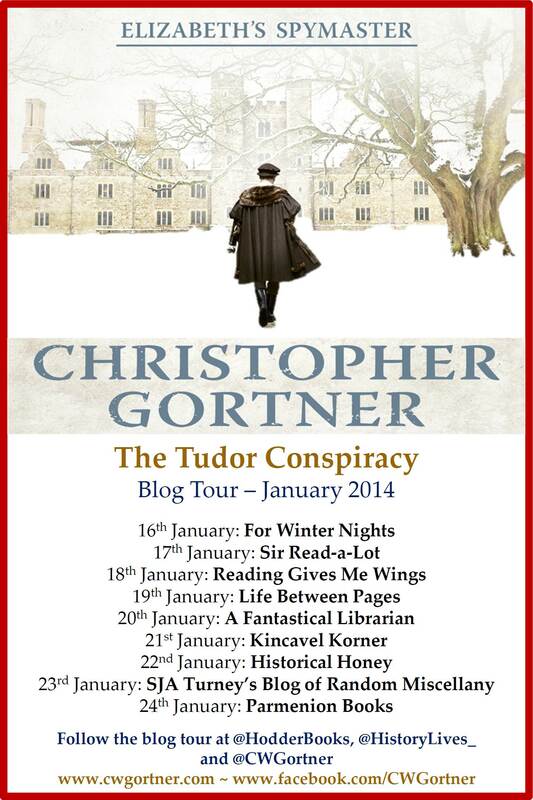 The Tudor Conspiracy by Christopher Gortner is published by Hodder & Stoughton in paperback and ebook, £8.99. Go buy it. Amazon link here. Some time back I read the first two Agent of Rome books back to back and reviewed them. They were excellent reads, quite different from one another, given the fact that they are part of a series. So, when given the opportunity to read the third in the series, I leaped at the chance. 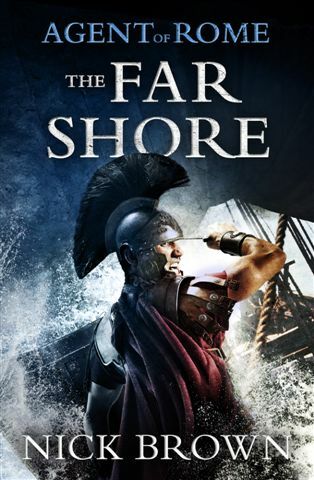 The Far Shore continues the adventures of Cassius Corbulo of the Imperial Security Service (the Grain men or Frumentarii), his Gaulish slave Simo, and his ex-gladiator bodyguard Indavara. It takes place only a short time after the events of The Imperial Banner, and continues to build the relationship between the characters. I will (as usual) not delve too deep into the plot, in case of spoilers for people, but I will say a few things. For those of you who have read the first two, this third book bears a lot more resemblance to the second than the first, in that it is considerably more investigative than martial. While the first novel was an eponymous siege, and the second was based around the recovery of a stolen item, this third is a manhunt that crosses seas and takes place in more than one province. Do not be thrown by the cover, which might suggest a very naval tale. While large sections of the book take place at sea, there are also hefty sections on dry land. With Nick’s usual flair for the dramatic, the plot never lets up and even when you think everything should be over and settled, you look and realise there’s still a hundred pages left and the excitement is far from over. Character is important in Nick’s books. Containing his protagonists to the three men with a small supporting cast means that the characters get a lot of exposure and shine. Given the huge differences in their character, background and status, the interplay between them is always stunning. The first book saw a great deal of development in Corbulo’s character, and the second did much the same with Simo. Well this third book expands the scope and depth of Indavara nicely. In addition, a few of the supporting cast were beautifully portrayed (I’m thinking particularly of Carnifex and Eborius). There is, I think, a tendency in Roman fiction to place too much emphasis on authenticity at the expense of readability (while there is also – particularly in the self publishing market- much the opposite.) Nick Brown has hit it just right, I think, to feel authentic and maintain a good level of historical accuracy, and yet not compromise the ease of reading and the touch of modern colloquialism that makes the reader identify with the tale. His speech is realistic and his descriptive atmospheric without being burdensome. In all, the writing is so tight and comfortable that it drags you along apace without the requirement to expend effort. I would say that in this third installment there are a few moments of predictability that were not there in the first two. Some actions and responses were a little obvious, but do not let that put you off in any way. To some extent it actually helps, given the subject matter. After all, this is basically a spy thriller/action adventure. James Bond would not be James Bond without a little capture and humiliation. Indiana Jones would have suffered had it lost a few of its predictable moments. A sense of anticipation of events helps. Action, excitement and mystery, mixed with a little vicious, bloody violence and a well-rounded tight sense of humour that surfaces at just the right times. All in all, I would say that The Far Shore is a good, solid, thrilling continuation of the series and a growth of the main characters, while exploring newer, more varied territory. I look forward to Corbulo’s next foray with impatience. Read the book. Read all three if you haven’t. You won’t regret it.